1. V. cholerae O1 and O139 serogroups are the causative agent of cholera leading to large morbidity and mortality. 3. Conventional methods of diagnosis is inconvenient and delayed process for early detection. 4. 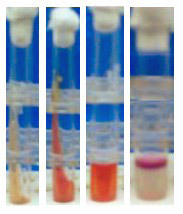 To overcome these difficulties, RMRC, Bhubaneswar has developed a Quadruplex PCR assay that can detect simultaneously serogroup, biotype, toxigenic potential and regulating factor, which is simple, rapid and cost effective. 5. Again to eliminate the complicated steps of Quadruplex PCR, we developed an easy PCR Kit that is very simple, rapid and cost effective and can be easily performed by trained technicians to give early diagnosis during cholera outbreaks. 1. Cholera continues to be one of the major threats for public health problems particularly in developing countries caused by V. cholerae O1 and O139 serogroups. 3. 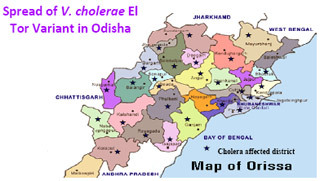 V. cholerae O1 El Tor variant harboring classical cholera toxin B gene caused a cholera epidemic in southern districts of Odisha in 2007. 4. Subsequently V. cholerae O1 El Tor variant spread to 26 districts during 2008-11causing cholera outbreaks. 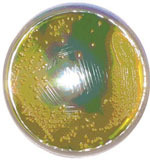 5 Gradually El Tor variant is becoming dominant replacing the resident prototype El Tor vibrio. © 2016 RMRC. All rights Reserved. Designed & Developed by Luminous Infoways.